It was about this time last year that several weeks of silliness began. It is a tradition in my Stitchin' B group that all birthday's are very special, but the 50th is one that is celebrated with much enthusiasm...... This pink pig was part of the celebrating, along with many other little piggies used for a scavenger hunt at our victims, I mean birthday celebrants home. 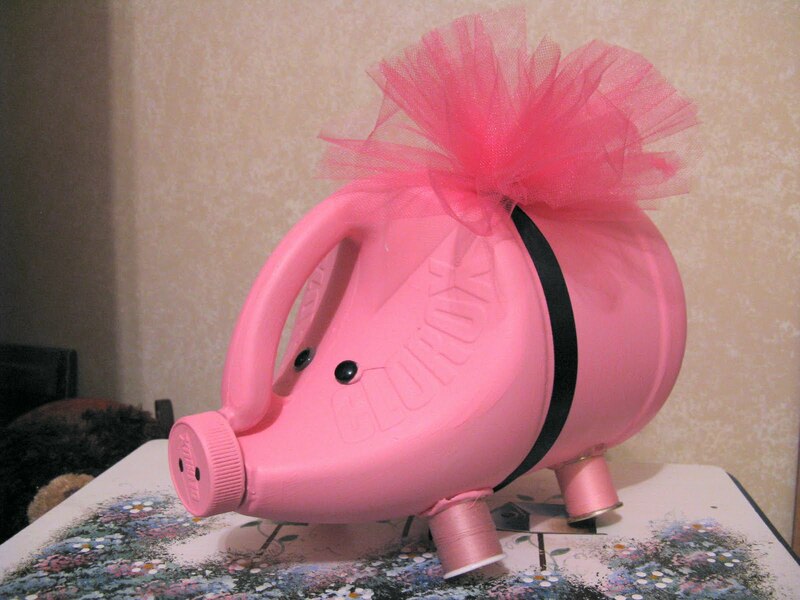 Just in case you want to make this little cutie, all you need is an old Clorox bottle, be sure to rinse it out. I painted the pig with brush on craft paint, but spray would work great too. I glued on some button eyes, painted little black dots on the nose, and added a tulle bow with black ribbon. There is also a pink curly tail made out of pink fuzzy pipe cleaner. I glued spools of thread on for the legs. My husband says that when he was in grade school, he made a "piggy bank" out of a Clorox bottle, so he gave me lots of ideas. I don't think his piggy bank looked as pretty though!!! So I guess you could say "party till the pigs come home" if it's your birthday!!! I made one in Girls Scouts; as a child. I am now 63 years young. A dear friend keeps saying she wishes she had hers. I am going to make her one for Christmas and let my grand children help me!